Based on Fay's 30+ years of professional experience using the Air Planishing Hammer, this book is a comprehensive look into the history, uses and techniques. Provides you with the information to set up and use your air-planishing hammer efficiently and effectively. 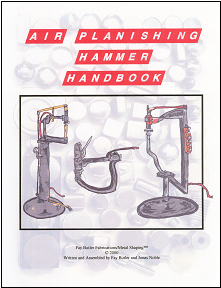 All the content in this book applies to various manufacturers of air planishing hammers manufactured in the past, including Chicago Pneumatic, Milwaukee, Watervliet, Rams Head, Weaver, and others.